A terminally ill man struggles to break the news of his fate to his dysfunctional family. 'Home is where the hatred is,' sang Gil Scott Heron in his 1971 funk ballad. "You can choose your friends but you sho' can't choose your family," wrote Harper Lee in To Kill a Mockingbird, a quote that's since warped into a lament for familial relations rather than a sentimental tribute. It would seem Xavier Dolan agrees with both sentiments. This is a filmmaker whose debut was titled I Killed My Mother, and throughout his filmography the home has been portrayed as a chaotic place, populated by characters who would seem as much at home living in a 17th century castle on some Swiss hill as in the working class suburbs of contemporary Quebec and France. 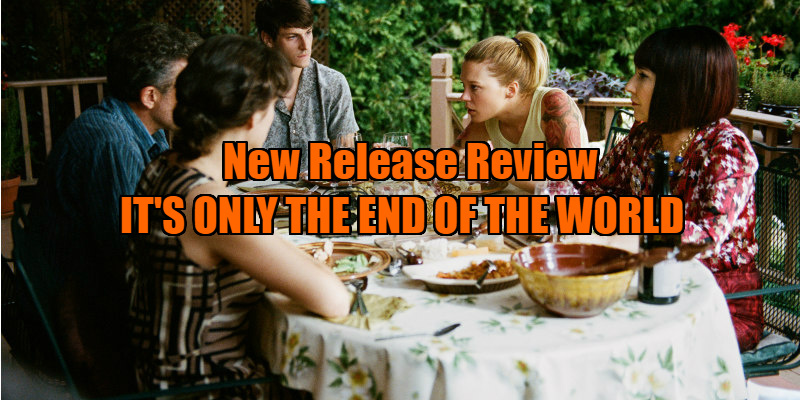 His latest, It's Only the End of the World, is perhaps his most toxic poison-pen letter to the family, an all-star drama roundly decried as insufferable and self-indulgent by critics following its world premiere at last year's Cannes Film Festival. I don't concur that Dolan's film is insufferable and self-indulgent, but its characters certainly are. All except its protagonist, Louis (Gaspard Ulliel), a playwright who returns to his home after a prolonged absence with the intention of breaking the news of his terminal illness to his family. The household consists of his mother, Martine (Nathalie Baye), clinging onto her youth with make-up that gives her the look of a witch from a Mario Bava movie; younger sister Suzanne (Léa Seydoux), imprisoned at home like so many young Europeans by a cruel economy; and older brother Antoine (Vincent Cassel), bubbling over with rage and resentment at Louis's fleeing the nest while he stayed behind and sank into a life he didn't want. Also present is the latter's timid wife, Catherine (Marion Cotillard), the only one of the group lacking enough narcissism to twig early on that Louis has something on his mind. As you'd expect from Dolan, It's Only the End of the World is easy to admire, but it's often difficult to bear. He makes experimental choices that are understandable on paper, but don't quite translate on screen. The incessant extreme closeups and overbearing score are presumably intended to reflect Louis's feeling of being smothered by his family, but it becomes so overbearing that it's an unpleasant experience. A movie's audience doesn't always want to share its characters feelings and senses; that's why smell-o-vision never took off. Adapted from a play by French writer Jean-Luc Lagarce, Dolan's treatment certainly can't be accused of simply being a 'filmed play'. It lies at the extreme opposite end of the stage adaptation spectrum to Denzel Washington's Fences, with Dolan pulling a host of visual tricks out of his sleeve like a magician desperate to win over a tough crowd. There's a middle ground between Washington and Dolan's methods that would no doubt make It's Only the End of the World a more comfortable watch, but that's just not Dolan's style. I get the impression he's a filmmaker who would rather have his film panned angrily by critics than go unnoticed with middling reviews, but if so, I'm unable to give him such satisfaction here. It's Only the End of the World may be his biggest misfire to date, but it's far from a disaster; the performances from a mouth-watering cast alone are enough to keep fans of French language cinema engaged. Its only crime is the folly of youth, and with six features already under his belt, it's easy to forget its director is still in his mid-twenties. If this were the debut of a 27-year-old, I suspect we'd all hail Dolan as one to watch for his distinctive and committed style. We have in the past, and I'm sure we will again. 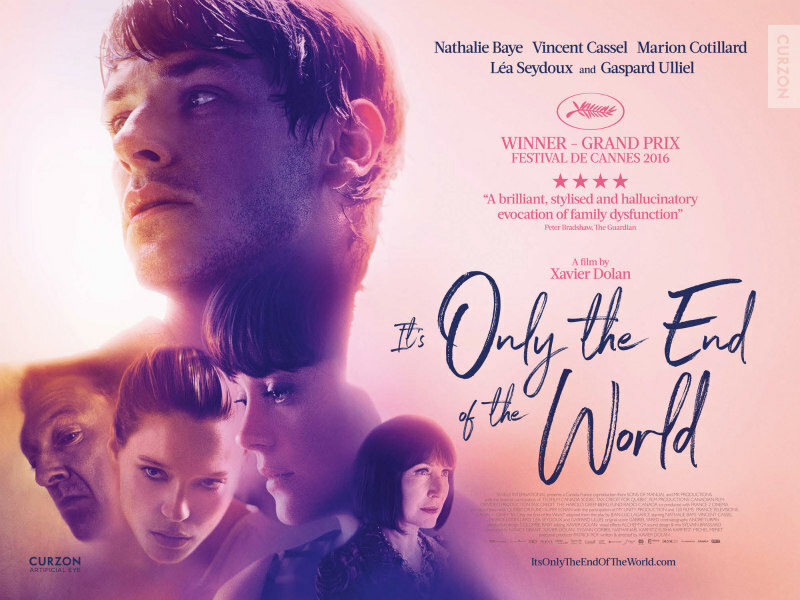 It's Only the End of the World is in UK/ROI cinemas February 24th.